Pruning your landscape hedges at the right time ensures they develop their optimum form and keeps them from becoming too large or overgrown for the space. Hedge shears or trimmers are typically used for formal hedges, while simple bypass pruners are suitable for any type of hedge. Before pruning, disinfect shears in a solution of one part bleach and nine parts water, because diseases can be an issue regardless of the pruning time. A gardener trims low hedges. Newly planted hedges typically require some pruning right after planting. Hedges are often planted in late winter or spring before the plants fully awake from dormancy or in summer or fall when they are actively growing. Cut back spring-planted hedges immediately after planting before the buds begin to break and cut back summer-planted hedges late in the season after the plants go dormant. Cutting back the upright stems to a 6- to 8-inch height encourages branching when the hedges resume growth in spring. The extra branching results in a fuller, more compact hedge that takes less effort to shape and maintain after it reaches maturity. Pruning flowering hedges at the wrong time prevents the hedge from producing flowers the following season. Some flowering shrubs, like camellias (Camellia spp. ), which grow in US Department of Agriculture plant hardiness zones 6 through 9, flower from late summer through winter and require spring pruning. Spring or summer flowering shrubs are usually pruned immediately after flowering regardless of the season. If a plant produces flower buds on old wood soon after it finishes the current season's bloom, always prune it after flowering. If it flowers on new wood it produces in the spring, you can usually trim the hedge after flowering or in late winter before new growth begins. Hedges grown only for their foliage aren't usually as picky about pruning time. Generally, these hedges are best trimmed right before they break dormancy in late winter or early spring. Evergreen hedges, such as boxwood (Buxus spp. ), hardy in USDA zones 6 through 8, require cutting back for size and shape in early to mid spring. Regular light summer pruning is also necessary to prevent overgrown branches or to control rapid summer growth. 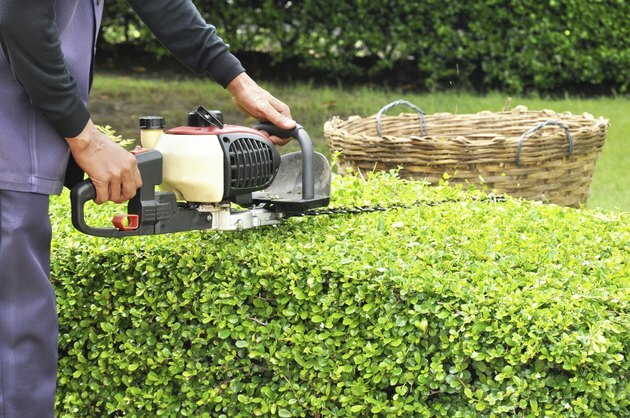 Formal hedges, with neatly clipped and shaped sides, require more frequent pruning through summer, while informal hedges left in their natural shape require only light pruning to remove dead wood and to maintain their height and width. Most deciduous nonflowering hedges are grown as informal hedges so they require only maintenance pruning in early spring just before the new leaf buds begin to break. For example, barberry shrubs (Berberis spp. ), hardy in USDA zones 5 through 9, require only removal of dead wood and light heading back to the height and width of the shrub. Spring rejuvenation pruning keeps these hedges healthy and compact so their natural shape remains attractive through summer. You can also trim out broken or badly overgrown branches as needed throughout summer.